Food supplement with probiotics, prebiotics and oregano. 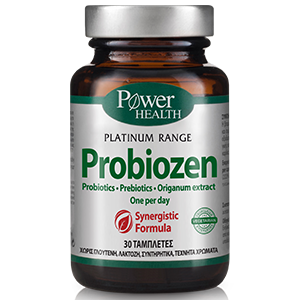 Probiozen offers a unique combination of high concentration specialized probiotics (mixture of lactic acid bacteria and bifidobacteria), along with prebiotics (inulin and oligofructose) and oregano extract. One capsule per day offers 3 billion live cultures of probiotics. Prebiotics:Specific ingredients such as inulin and oligofructose, considered the “food” of probiotics. Oregano:Symbol of happiness in ancient Greece, the traditional herb of Mediterranean cuisine is rich in phytonutrients such as thymol, carbacol and rosmarinic acid. The ingredients of oregano have been extensively studied for a number of beneficial effects. People who want to enrich their daily diet with probiotics and prebiotics. Take 1 tablet daily, preferably before or during the meal as a food supplement or in accordance with the instructions of your doctor. Gluten, preservatives, fragrances, artificial colors.